Holiday Gift Guide 2011. A fit girl is never more happy than when she is being active. When she is fit she feels healthy and beautiful. A fit girl is stylish and discerning about what she puts on her body and in her body. Here is my pick of smart gift ideas to support your fit girls’s active lifestyle. Seriously, how much technology can you cram into a pair of sport socks? Your fit girl will be pleasantly surprised that you scored her a pair of the Compressport Proracing socks. She’ll love the funky 3D.DOT’s that provide accupressure in all the right spots, air flow, grip, water extraction and blister protection. Not to mention they are anitbacterial and ergonomically correct. Phew, that’s alot of technology in a sock. Available in trail, running and bike models. We now know that stretching is not always the best way to release a tight muscle or a elimnate trigger points (knots in muscle). Compression is a far superior way to get into the muscle to help it ‘release’. A fit girl trains hard and knows that the best way to prepare for activity and to ‘regenerate’ after activity is with body rolling. The Travel Roller is the earth friendly and ergonomically correct body roller that your fit girl can fit in her gym bag. Don’t forget the accupressure balls for those hard to reach trigger points and luxurious foot release! A fit girl knows that the right fuel is the key to looking good and feeling great. Fresh and wholesome salads, hearty soups and energy packed snacks are on the menu every day and getting them to work has never been more simple and stylish. She’ll love this award winning Lunch Pot by Black + Blum. 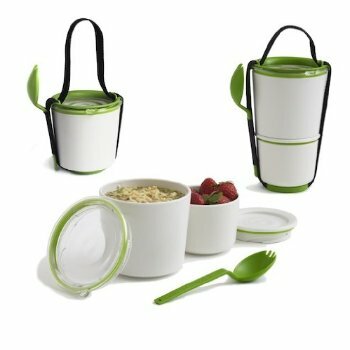 Watertight, includes spork, microwave and dishwasher safe and it’s BPA free. No room for a treadmill? A UGI ball is one fitness tool I can use to work up a decent sweat in my living room and feel it the next day. My heart rate is just as high as it would be on a treadmill or elliptical. It’s easy to store, there are hundreds of exercises and the included DVD workouts makes it one fitness tool that your fit girl will love.